Petr Effenberger's personal blog about programming in Java and other languages. I was recently asked to provide db based user authentication for a relatively application, which user primarily ldap user authentication. This nearly backdoor-looking feature is only for a handful of users which made it ideal for experimentation. I could have stored user passwords as plain-text and nobody else would ever know, but the one person that would know matters the most, me. Almost every application uses passwords for user autentization. Although in complex environment, you don't usually want users to have different password for every application, there are situations that needs different approach. And in those times, security shouldn't be taken lightly. Whether you are writing small intranet application, or full scale internet application, you should always protect your user's accounts, because a lot of studies suggest that majority of users use the same password for everything, so for these users, when one application falls, they all fall. That is the reason why have i decided to do a small research how to protect user passwords the right way. The most commom way to protect passwords from being misused when stolen is hashing. Hashing algoritms are often supplied with random characters alongside with plain-text passwords, this is called salting. Salted hash is better protected against brute-force attack, because of a higher complexity. I have considered several approaches and picked one that has suited me the most. I am now using hashing utility jBCrypt. It is a powerfull tool with very simple API and very good security. jBCrypt's API provides two main methods and one support method. Hashing password is done by hashpw method, it takes plain-text and salt as arguments. Returned hash is always 60 characters long, so storing the hash in database is quite simple as CHAR(60) is enough. Method gensalt is adjustable by passing optional int argument for complexity. Accepted values are 4 to 31 (default is 10 and higher number means more complex salt). The second important method is used for password verification. Method checkpw has two parameters, the first is a plain-text password and the second one is the hash created by previous method. Returned value is true, if the password matches the hash or false in other cases. I really like this implementation of BCrypt, as it is only one java class, which makes it easy to incorporate it into any project. Most of the applications I work on are based on jsp's and usually run on Jboss AS of various versions. And even though the newer applications are maven based and run on Jboss AS 7, almost nothing have changed in a matter of development. At least I thought that nothing have changed, but that was only because my carelessness. When you are developing web tier, there is no compiler telling you what is wrong in the real time, you depend on syntax validation only. And that enables you to do a lot of small mistakes that usually end up with error 500 and a need to redeploy the application. But this is the case only until you discover the right configuration! I recently deployed Jenkins CI on my personal server. The hardest question was what security solution should I use. As title of this post may have suggested I have chosen to use the infrastructure I already have ... LDAP. Now I would like to describe, how easy this configuration is and how it works. 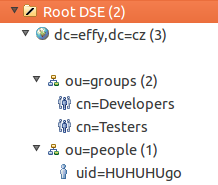 My LDAP structure My base dn is dc=effy,dc=cz. And it contains two organizationUnits ... ou=people (to hold users) and ou=groups (to hold user roles). Groups (Roles) are presented by objectClass groupOfNames, they are identified by cn. People (Users) are of objectClass inetOrgPerson, thus identified by uid. I have recently begun experimenting with the Apache Wicket web framework. But when I launched the Wicket's examples, I have encountered "java.lang.IllegalArgumentException: Argument 'beanManager' may not be null" expeption. Even though the solution is quite simple, I don't think that it is as documented as it should be. And the fact that it is the only problem preventing the Wicket's example application from running on Jboss AS 7 is fairly grim.